Germany is demanding explanations from the online retail giant Amazon after a TV documentary showed seasonal workers being harassed by security guards. A TV documentary by state broadcaster ARD said employees' rooms were searched, they were frisked at breakfast and constantly watched. Employment Minister Ursula von der Leyen said some employment agencies could lose their operating licences. In a statement, Amazon said it would follow up complaints. "The suspicion weighs heavily; therefore all facts must be put on the table as quickly as possible," Mrs von der Leyen told the Welt am Sonntag newspaper. "If the special investigation finds that there is some substance to the complaints against the employment agencies, then their licences are in question." The film showed the living and working conditions of agency workers brought in to help with the Christmas rush, principally at an Amazon warehouse in Bad Hersfeld, in the state of Hesse. It showed staff living quarters in cramped holiday accommodation a long way from the Amazon warehouse, which could only be reached by an unreliable bus service. Many of the temporary workers came from Spain and Poland. Workers from outside Germany were shown as receiving the worst harassment from security guards from a private firm, Hensel European Security Services (Hess). Hess was under contract to an employment agency, not to Amazon itself. The firm said it rejected allegations that it supported the far-right. However, it confirmed its guards had carried out room searches. 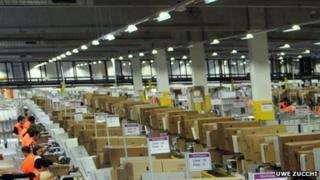 In a statement, Amazon said: "Our goal is to deliver orders quickly and reliably to our customers. "We know this only works with a contented workforce... We will follow up each incident in our logistics centres and their surroundings which is brought to our attention by our staff, and if need be, will implement thorough improvements."